The image below shows the orbital path of Venus. If it looks a little odd, that’s because it doesn’t show the path of Venus relative to the Sun, but rather relative to Earth. It is taken from a 1799 book by James Fergeson entitled “Astronomy Explained Upon Sir Isaac Newton’s Principles”. This was an astronomer’s handbook, so it gave the motion of Venus and other planets as we see them on Earth. 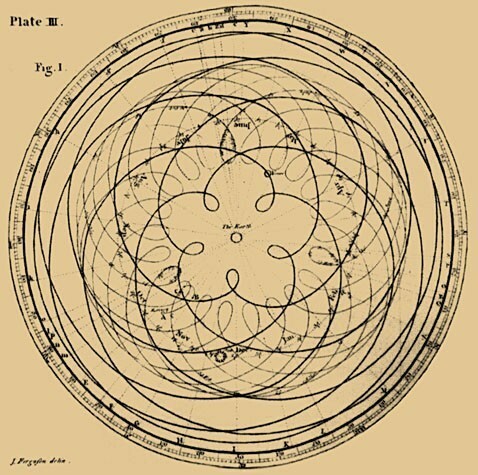 You might notice that the path of Venus seems to follow a kind of five-fold spirograph path. This is because Venus orbits the sun once every 224.7 days, while the Earth 365.25 days. The ratio of these two periods is 0.615, or about 8 to 13. Since the difference between 8 and 13 is 5, the path of Venus has a five-fold symmetry relative to Earth. This pattern is sometimes called the Rose of Venus. Ratios such as the 8 to 13 ratio between Earth and Venus are relatively common. They happen through a process of orbital resonance, where the small gravitational interactions between planets reinforce their stable orbits. For planets, these ratios are only approximate, but they are stronger for smaller bodies. For example, three of the moons of Jupiter (Io, Europa and Ganymede) have orbital ratios of 1 to 2 to 4. In asteroids there is a related effect where certain resonances between Jupiter and the asteroids are orbitally unstable. This means any asteroid that happens to have such a resonance is pushed a bit either closer or further from the Sun. The result is a series of gaps in the asteroid belt known as Kirkwood gaps. When you look at patterns such as this, you can see how difficult it was to accurately describe the motions of the planets. Imagine starting with a pattern like this and proving the planets are actually moving around the Sun. Often what seems obvious now is hard to figure out at first. Fabulous book title and a very nice diagram. Thanks!